Cancun has some of the best beaches in the world. The beaches are, without question, the biggest draw in Cancun with their soft, white, powdery, sand and crystal clear, warm, turquoise water. There are eleven beaches in Cancun, each of which has its own distinctive personality, and all of which are open to the public. The very best beaches are at the north tip of the island. Cancun is surrounded by crystal clear water and lies next to the largest coral reef in the Americas. This makes it a haven for snorkellers and scuba divers. The calm waters also offer perfect conditions for water skiing. Other popular water sports here include parasailing and jet skiing. In addition, there is a large modern water park in Cancun with a wave making machine, slides, and a free fall thrill ride. Cancun's surrounding waters also offer some excellent sport fishing and deep sea fishing for sailfish, wahoo, dorada, marlin, grouper and bluefin tuna. Cancun is a duty-free zone that has evolved into a shopper's paradise. The Hotel Zone is dotted with large modern air-conditioned malls filled with boutiques selling designer label merchandise and perfumes at bargain prices. The traditional markets in Old Cancun have numerous small shops selling locally made handicrafts, silver jewelry and colorful Yucatan hammocks. Good natured bargaining at these smaller shops is expected. 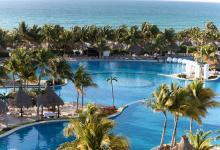 Cancun has an impressive variety of restaurants catering to all tastes and budgets. There are establishments that serve traditional Mexican dishes, Yucantecan entrees, international gourmet cuisine, all-you-can-eat buffets, American style fast food, etc. Dining aboard a boat on one of Cancun's many theme dinner cruises is popular with many visitors. Laguna Suites Hotel Canc more. This property is 3 minutes walk from the beach. Set in the CancÃºnâ€™s Hotel Zone and 3 km from the Caracol Shopping Centre, the Sunset Marina &Yacht Club features Mediterranean-style architecture, a sun terrace, swimming p more. The suites offer modern decor, air more. When you stay at Mayan Palace, you'll enjoy a vacation filled with fun, relaxation, and the very best service in Mexico. With six different destinations offering six distinctly unique and beautiful locales to experience the wonder more.